Space Saving Drive In Pallet Racking! Make optimal use of your Ashford storage space with our drive in pallet racking! Do you need to store large quantities of products but just don't have the space? With a simple addition of drive in pallet racking, you can truly maximise the use of your available space in your warehouse or storage facility! Ideal for any commercial or industrial environments, especially cold-stores, our drive in pallet racking makes storage simple and quick and give you complete control over retrieval and storage options in your Ashford premises. At Acorn Storage, we specialise in providing Ashford businesses with highly effective and space saving drive in pallet racking for very competitive prices. So call us today on 01634 296927 to discuss your drive in pallet racking requirements and arrange your FREE property survey and no obligation quotation at your convenience. Supplied and installed across Ashford by our experienced and dedicated team, our drive in pallet racking is perfect for when space is at a premium. One of the most effective and optimal ways of maximising your available storage space, drive in pallet rackng makes the loading and retrieval of pallets quick and easy and prevents goods from becoming damaged too. Quite simply, by eliminating aisles and lanes, our drive in pallet racking makes it quick and easy to maximise cubic space and enable more pallets to be stored per cubic metre than any other storage system on the market today. With stock rotation limited, this system is best suited for the storage of bulk goods of the same type or seasonal goods. Alongside offering you and your Ashford business maximum profitability of the storage space available, our drive in pallet racking will allow you total control over all retrieval and storage operations. There are two operating systems available; drive-through and drive in. The drive through system allows for goods to be accessed from both sides of the pallet racking, meaning that the first pallet to be inserted is also the first to be extracted. Conversely, the drive in system only has one access aisle and means that the first pallet deposited will be the last one to be extracted. Based in Rochester, Medway, we provide industrial and commercial clients from across Ashford and Kent with the very best in drive in pallet racking. 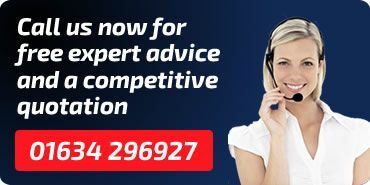 Contact us today to discuss your requirements and arrange your no obligation quotation at your convenience with one of our friendly and experienced team.